**BLUETOOTH**, ** ONE OWNER **, **SERVICE RECORDS AVAILABLE**, **SIRIUS XM SATELLITE RADIO**, **CD PLAYER**, **REMOTE KEYLESS ENTRY**, **GUARANTEED FINANCING AVAILABLE**, **WARRANTY INCLUDED**, **A+ Better Business Bureau **. CARFAX One-Owner. 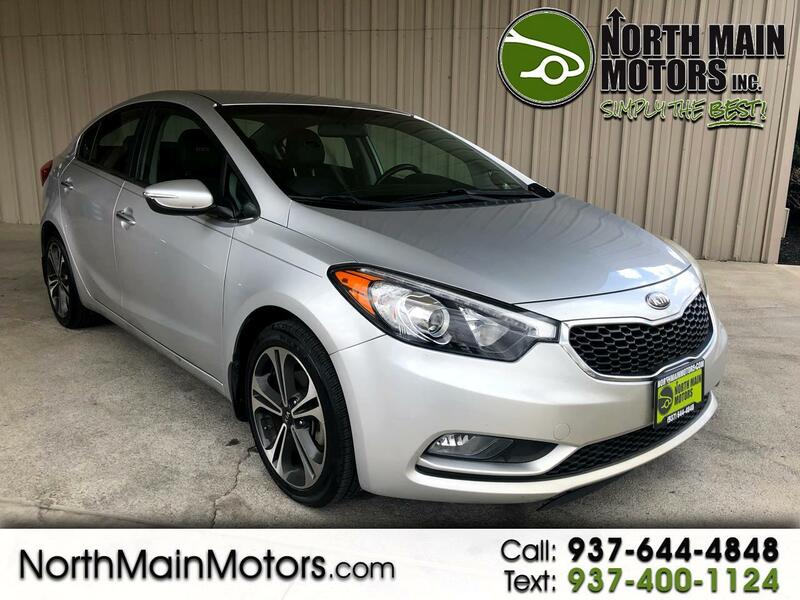 North Main Motors is excited to offer this superb-looking 2014 Kia Forte EX In Bright Silver. This vehicle is beautifully equipped with 4-Wheel Disc Brakes, 6 Speakers, 6.5J x 16" Alloy Wheels, 7.0J x 17" Alloy Wheels, ABS brakes, Air Conditioning, AM/FM radio: SiriusXM, Brake assist, Bumpers: body-color, Cargo Tray, Carpeted Floor Mats, CD player, Cloth Seat Trim, Delay-off headlights, Driver door bin, Driver vanity mirror, Dual front impact airbags, Dual front side impact airbags, Electronic Stability Control, Front anti-roll bar, Front Bucket Seats, Front Center Armrest, Front fog lights, Front reading lights, Front wheel independent suspension, Fully automatic headlights, Heated door mirrors, Illuminated entry, Leather Shift Knob, Leather steering wheel, Low tire pressure warning, MP3 decoder, Mudguards, Occupant sensing airbag, Outside temperature display, Overhead airbag, Overhead console, Panic alarm, Passenger door bin, Passenger vanity mirror, Power door mirrors, Power steering, Power windows, Radio: AM/FM/CD/MP3 Audio Unit, Rear seat center armrest, Rear window defroster, Remote keyless entry, Speed control, Speed-sensing steering, Split folding rear seat, Steering wheel mounted audio controls, Tachometer, Telescoping steering wheel, Tilt steering wheel, Traction control, Trip computer, Turn signal indicator mirrors, Variably intermittent wipers, and Wheel Locks! Reviews: * The 2014 Kia Forte's key strengths include its good looks, great tech and a generous warranty. Source: KBB.com * Spacious interior for both sedan and coupe; many upscale features available; strong engines on EX and SX trims; easy-to-use controls; lengthy warranty coverage. Source: Edmunds * The peppy, economical, four-door Kia Forte has been redesigned for 2014! It's larger and roomier than the previous generation of Fortes, and boasts a new, sportier exterior. As with all Kia models, the 2014 Forte packs a lot of bang for your buck. The quieter engine and refined suspension mean a pleasant ride that feels like a larger, more expensive car. You can choose either the six-speed manual transmission, only available in the LX trim, or the six-speed automatic with overdrive that is standard in the EX and an option in the LX. Depending on your choice of trim, you'll enjoy fuel economy ranging from an EPA estimated 24 MPG in the city, to 37 MPG on the highway. The trunk is generously-sized, larger than most compact vehicles, meaning you can fit all your gear, from groceries to golf clubs. Standard equipment includes steering wheel mounted audio controls, electronic stability control, and heated door mirrors. For added style, consider the available Premium Package, with items such as leather seat trim, power sunroof, push button start, ventilated driver's seat and heated steering wheel. The Forte is also offered as a five-door hatchback, and the sporty two-door Forte Koup, each having its own unique specifications, capabilities, and package specifics. Source: The Manufacturer Summary From the moment you step on our lot until the time you drive away in your next car, your buying experience with North Main Motors is our number one priority. We encourage you to use the expertise and resources of our sales staff - they are here to help you find the right car at the right price. Call us today at 937-644-4848 to schedule your test drive!